Many bacteria-associated polysaccharides induce long-lived Ab responses that protect against pathogenic microorganisms. The maintenance of polysaccharide-specific Ab titers may be due to long-lived plasma cells or ongoing Ag-driven B cell activation due to polysaccharide persistence. BALB/c and VHJ558.3 transgenic mice respond to α1→3-dextran (DEX) by generating a peak anti-DEX response at 7 d, followed by maintenance of serum Ab levels for up to 150 d. Analysis of the cellular response to DEX identified a population of short-lived, cyclophosphamide-sensitive DEX-specific plasmablasts in the spleen, and a quiescent, cyclophosphamide-resistant DEX-specific Ab-secreting population in the bone marrow. BrdU pulse-chase experiments demonstrated the longevity of the DEX-specific Ab-secreting population in the bone marrow. Splenic DEX-specific plasmablasts were located in the red pulp with persisting DEX-associated CD11c+ dendritic cells 90 d after immunization, whereas DEX was not detected in the bone marrow after 28 d. Selective depletion of short-lived DEX-specific plasmablasts and memory B1b B cells using cyclophosphamide and anti-CD20 treatment had a minimal impact on the maintenance of serum anti-DEX Abs. Collectively, these findings demonstrate that the maintenance of serum polysaccharide-specific Abs is the result of continuous Ag-driven formation of short-lived plasmablasts in the spleen and a quiescent population of Ab-secreting cells maintained in the bone marrow for a long duration. Plasma cells are the terminal differentiated progeny of B lymphocytes activated by Ag or mitogens. It is becoming increasingly clear that plasma cells are not only the end stage of B cell differentiation, but also constitute a separate cell compartment accounting for serologic memory to protein and viral-based vaccines (1, 2). Plasma cell differentiation is driven by the increased expression of Blimp-1, which is associated with plasmablasts exiting cell cycle (3, 4), chemokine changes promoting their migration into the bone marrow (5–7), and downregulation of costimulatory molecules along with their surface Ig (1, 4). Mature plasma cells can be divided into short- and long-lived populations. Short-lived plasma cells can be generated by both T cell-dependent and independent mechanisms, whereas long-lived plasma cell development has mostly been studied in Ab responses dependent upon T cell help (8). Maintenance of both plasmablasts and short-lived plasma cells appears to depend upon ongoing inflammatory conditions (9), whereas long-lived plasma cells are maintained under noninflammatory conditions in the bone marrow (1, 2). It has been clearly shown in humans and in mice that long-lived plasma cells (1, 2) are quiescent, persistent, and produce Ab in the absence of Ag, leading some to coin the term “plasma cell memory” to describe their function (10). More recently, it has been shown that homeostasis of long-lived plasma cells is not dependent upon memory B cells, indicating that this population constitutes an independent compartment responsible for serologic memory (11). In mice and humans, the persistence of polysaccharide-specific Ab production in the spleen (12–15) has led to the suggestion that polysaccharides, like T cell-dependent Ags, have the ability to generate long-lived plasma cells (9). However, it is unclear whether plasmablasts generated in response to polysaccharide Ags possess the capacity to migrate into the bone marrow and become long-lived plasma cells similar to their T cell-dependent counterparts (16). Alternatively, maintenance of anti-polysaccharide Ab serum Ab titers may result from continuous Ag-dependent stimulation of B cells. It is known that bacteria-associated polysaccharides persist in tissues of mice and humans for long periods of time after bacterial infection or deliberate immunization with polysaccharide. This persistence may result from their polymeric nature and absence of host glycolytic enzymes capable of degrading them (17–20). Ab-secreting cells (ASCs) generated in response to the synthetic polysaccharide 4-hydroxy-3-nitrophenyl acetyl (NP) conjugated to Ficoll (NP-Ficoll) are actively dividing within the spleen even at late stages in the persisting Ab response (14, 21), arguing for an important role for NP-Ficoll persistence in driving an ongoing Ab response (19). A recent report showed that mice immunized with type 3 pneumococcal polysaccharide generated a functionally distinct population of radiation-resistant plasma cells responsible for maintenance of polysaccharide-specific Ab titers independent of memory B1b B cells. These plasma cells provided serologic protection against Streptococcus pneumoniae infection and appeared to persist in the bone marrow for the duration of Ab production analyzed (22). These findings have been complemented by a recent publication demonstrating a role for IgM-producing, bone marrow ASCs in providing long-term protection to Ehrlichia muris infection (23). However, it is not entirely clear from these studies whether the maintenance of long-lived IgM dominated Ab responses to polysaccharides and bacterial outer membrane proteins results from a continual response to persistent Ag or is established in a manner similar to the conventional long-lived plasma cell pool considered to be independent of persisting Ag stimulation. To examine the role of polysaccharide persistence and turnover of polysaccharide-specific plasma cells in long-lived Ab production, we characterized cellular aspects of the Ab response to epitopes formed by α1→3-glucosidic linkages in bacteria and α1→3-dextran (DEX), a large m.w. glucan. This or a similar epitope is present on a variety of clinically relevant organisms including the opportunistic pathogen Enterobacter cloacae (24), fungi including the dimorphic fungal pathogen Histoplasma capsulatum (25), and the commensal fungus Aspergillus fumigatus (B. Dizon and J. Kearney, unpublished results), as well as the epiphytic bacterial species Leuconostoc mesenteroides (26). Both purified DEX and DEX-expressing E. cloacae induced prolonged production of IgM, DEX-specific Abs, which was largely independent of persisting DEX-driven plasmablast generation occurring in the spleen. Instead, the response was maintained by a novel population of cyclophosphamide and anti-CD20–resistant ASCs that persisted for a lengthened duration in the bone marrow throughout the Ab response. These results show that the long-lived Ab response observed in these experiments is partly attributed to the generation of a quiescent, Ag-independent Ab-secreting population capable of maintenance of long-lasting IgM-specific Ab response to polysaccharide Ags. VH J558 transgenic mice were generated, as described previously (27), and backcrossed onto the C57BL/6 background for >10 generations. Female BALB/c, athymic BALB/c Foxn1nu/J and C57BL/6 mice were purchased from The Jackson Laboratory (Bar Harbor, ME). All mice were bred and housed in specific pathogen-free facilities according to rules and regulations established by the University of Alabama at Birmingham animal resource program. Eight- to 16-wk-old VHJ558 transgenic and 8- to 16-wk-old female BALB/c or athymic BALB/c mice were immunized i.v. at day 0 with either 50 μg purified DEX (B1355S), 108 heat-killed, paraformaldehyde-fixed E. cloacae strain MK7 (24), or DEX-negative strain cBAN (a gift of A.J. MacPherson, University of Bern, Bern, Switzerland). Mice were injected i.p. with 35 mg/kg cyclophosphamide (Sigma-Aldrich, St. Louis, MO) (28) on days 31–34 post-E. cloacae strain MK7 immunization. At 30 d post-E. cloacae strain MK7 immunization, mice were given weekly injections of anti-mouse CD20 (a gift of R. Dunn, Biogen Idec, San Diego, CA) or an IgG2a isotype-matched control at a concentration of 20 mg/kg for consecutive 3 wk. At appropriate time points, mice were sacrificed, and blood and tissues were harvested for ELISA, ELISPOT, FACS, and histological analysis. FITC-labeled, anti-CD4, and anti-Ki67; PE-labeled anti-mouse IgM, anti–Mac-1, anti-CD19, anti-CD80, anti-CD86, anti-MHCII, and rat IgG2aκ; biotin-labeled anti–Mac-1, anti-CD11c, anti-CD16/CD32, annexin V Cy5, and 7-aminoactinomycin D (7AAD); and PE-Cy7–labeled anti-B220 were purchased from BD Pharmingen (San Diego, CA). Goat anti-mouse IgM Cy5 was purchased from Jackson ImmunoResearch Laboratories (West Grove, PA). Goat anti-mouse IgM PE and purified goat anti-mouse IgM, which was conjugated to Pacific Blue (Invitrogen, Carlsbad, CA), were purchased from Southern Biotechnology Associates (Birmingham, AL). PE anti-CD21 (clone 7G6) was described previously (29). Anti-DEX (IgMλ, clone 1-21), anti-λ (clone JC5-1), and TD6-4 and EB3-7-2, both specific for the anti-DEX idiotype (30), were all generated in our laboratory and directly conjugated to Alexa 488, 647, and Pacific Blue dyes (Molecular Probes, Invitrogen, Carlsbad, CA). DEX (gift of A. Jeanes, U.S. Department of Agriculture, Peoria, IL) was conjugated to Alexa 488 (Molecular Probes, Invitrogen). Heat-killed, paraformaldehyde-fixed E. cloacae strains MK7 (DEX+) and cBAN (DEX−) were conjugated to Alexa 647 dye (Molecular Probes, Invitrogen). All five- to seven-color FACS analyses were performed on a BD LSRII flow cytometer (BD Biosciences, Mountain View, CA) and analyzed using FlowJo software (Tree Star, Ashland, OR). Sera collected from VHJ558 transgenic and BALB/c mice immunized with each Ag were assayed for the presence of DEX-specific Abs using a previously established protocol (24). Briefly, serum diluted 1/1000 was incubated for 2 h at 37°C on 96-well enzyme immunoassay/RIA plates (Costar, Corning, NY) previously coated overnight at 4°C with 1 μg/ml purified DEX. Plates were washed and developed with goat anti-mouse λ alkaline phosphatase for 2 h at 37°C. Concentrations of DEX-specific Abs were quantified by ELISA using purified J558 Id+ IgM Ab (clone 1-21) as a reference standard. Numbers of DEX-specific ASCs in the spleen and bone marrow encompassing cells prepared from two femurs and tibia per mouse used in these experiments were determined by the following method. First, purified DEX or goat anti-mouse IgG, IgA, or IgM Ab was coated overnight at 4°C on enzyme immunoassay/RIA plates with high-binding, certified surface chemistry (Costar) at a concentration of 2 μg/ml, and then blocked for 1 h at 37°C with 1% gelatin solution prepared in PBS. Single-cell suspensions were prepared in RPMI 1640 (Life Technologies, Invtrogen, Carlsbad, CA) supplemented with 10% FCS (HyClone Laboratories, Logan, UT) from individual BALB/c mice sacrificed at 0, 7, 14, 28, and 60 d after immunization with each Ag, as described above. Large numbers ranging from 10 to 15 × 106 bone marrow or splenic cells were added to the first well and then diluted 5-fold in RPMI-C with 5% FCS to generate quantifiable spots. Plates were then incubated overnight at 37°C, and then washed with 1% Tween-20 in PBS three times the following day to remove cells. After washing, plates were incubated with either anti-λ, anti-IgA, anti-IgG1, anti-IgG2a, anti-IgG2b, anti-IgG3, or anti-IgM alkaline phosphatase conjugates purchased from Southern Biotechnology Associates diluted 1/500 with 1% Tween-20 in PBS at 37°C for 2 h. Plates were washed with 1% Tween-20 in PBS three times and developed for 4–12 h at 37°C in substrate buffer (pH 10.25) containing 1 M 2-amino-2-methyl-1-propanol (Sigma- Aldrich), 0.1% Triton-X405 (Fluka, Sigma-Aldrich), and 0.01 g/ml 5-bromo-4-chloro-3-indolyl-phosphate (Sigma-Aldrich). The next day, plates were washed in dH2O and dried, and the spots were counted. Total numbers of DEX-specific spots were calculated by multiplying the spot frequency by total cell numbers. Tissue sections were processed and viewed, as described previously (31). Frozen sections were stained with anti–Moma-1 (rat, IgG2aκ; a gift of G. Kraal, Vrije University Medical Center, Amsterdam, The Netherlands) and developed with goat anti-rat IgG Alexa 350 or 647 (Molecular Probes, Invitrogen), then blocked with normal rat serum (Peel-Freeze, Rogers, AR), and stained with Alexa 555-labeled TD6-4, which is specific for the anti-DEX idiotype (30), and CD4 FITC. To determine DEX persistence in BALB/c mice, frozen tissue sections were stained with Alexa 488-labeled DEX-specific IgMλ (clone 1-21) and anti-CD19 PE. Frozen sections from BALB/c mice immunized 90 d prior with DEX were stained with anti-DEX 488, goat anti-λ PE, and either biotinylated anti-CD11c or anti–Mac-1, which were developed with SA-Alexa 350. To detect dividing plasmablasts in E. cloacae-immunized transgenic (TG) mice, frozen sections were stained with anti-Ki67 FITC (BD Pharmingen) and TD6-4 Alexa 555. Data from three or more groups were analyzed by a one-way ANOVA test for data with normal distribution and Kruskal–Wallis test for data that did not distribute normally. Data with two groups were analyzed by a two-tailed unpaired t test to determine whether statistically significant differences existed. Statistically significant results were determined by a p value <0.01 (*), <0.01 (**), or <0.001 (***). BALB/c mice were immunized i.v. with E. cloacae as above, and were subsequently fed BrdU (Sigma Aldrich) in their drinking water at a concentration of 1 mg/ml for 7 d. Mice were then sacrificed 28 d after E. cloacae injection, and incorporation of BrdU in DEX-specific ASCs was evaluated by flow cytometry using the BD Pharmingen BrdU allophycocyanin kit. To determine the kinetics of the DEX-specific Ab response, BALB/c mice were immunized with soluble DEX, DEX-expressing E. cloacae strain MK7, or the DEX-negative strain cBAN. DEX-specific serum Ab titers and total numbers of ASCs were determined by ELISA and ELISPOT analysis, respectively, at 0, 7, 14, 28, 60, 90, and 150 d after immunization. Mice challenged with soluble DEX or E. cloacae, strain MK7, but not strain cBAN, generated DEX-specific Ab (Fig. 1A) and DEX-specific ASCs that were stable in number for at least 150 d (Fig. 1B, 1C, data not shown). VHJ558 TG mice generated a similar Ab response to these forms of DEX that persisted throughout the duration of analysis (data not shown). Ig isotype switching in DEX-specific ASCs 28 d after DEX or E. cloacae strain MK7 challenge of BALB/c mice was limited to IgG3 and IgA isotypes, as determined by ELISPOT consistent with patterns seen in the peak serum primary Ab responses. However, the proportion of IgG3 in the spleen was higher at 28 d in E. cloacae strain MK7 versus DEX-challenged mice (Fig. 1D). DEX-specific Ab production in BALB/c mice is long-lived. A, Concentration of serum DEX-specific λ+ Abs in BALB/c mice immunized with DEX, E. cloacae strain MK7 (DEX positive), and strain cBAN (DEX negative). The dotted line defines baseline DEX-specific Abs in the serum of naive BALB/c mice. B, Total numbers of λ+ DEX-specific ASCs in BALB/c mice immunized with purified DEX, E. cloacae strain MK7, or strain cBAN in the spleen (B) and bone marrow (C). The number of DEX-specific ASCs in the bone marrow was calculated from total bone marrow cells harvested from two femur and tibia per mouse. Ten mice per group were used for data derived from experiments in A–C. DEX-specific ASCs display restricted isotype usage, 28 d after immunization with DEX or E. cloacae strain MK7 in the spleen (D) and bone marrow (E). The data from D and E are derived from two independent experiments involving five mice per group. Isotype switching to IgG3 and IgA in response to DEX has been largely characterized as T cell independent (24). Examination of the expression of germinal center B cell Ags Fas receptor and GL-7 in BALB/c mice 14 d after immunization with E. cloacae strain MK7 confirmed that responding DEX-specific J558 idiotype+ B cells did not express either cell surface Ag at 14 d or at any other point in the response to E. cloacae strain MK7 in both BALB/c and TG mice (Supplemental Fig. 1A, 1B, data not shown). The ability to mount an effective DEX-specific Ab response in the absence of T cells was confirmed by immunizing athymic BALB/c mice with E. cloacae strain MK7. Both BALB/c and athymic BALB/c mice produced equivalent amounts of IgM DEX-specific Abs in response to E. cloacae strain MK7 immunization (Supplemental Fig. 1C). Furthermore, titers of serum DEX-specific IgG3 and IgA Abs were equivalent in BALB/c and athymic mice, indicating that these responses are also T cell independent (data not shown). These findings show that DEX-specific Ab production in response to either purified DEX or E. cloacae strain MK7 was sustained over 150 d by ASCs in the bone marrow and spleen of both BALB/c and TG mice in the absence of T cells. The prolonged DEX-specific Ab response could be mediated by continuous generation of plasmablasts/plasma cells in response to persisting Ag and/or long-lived plasma cells. 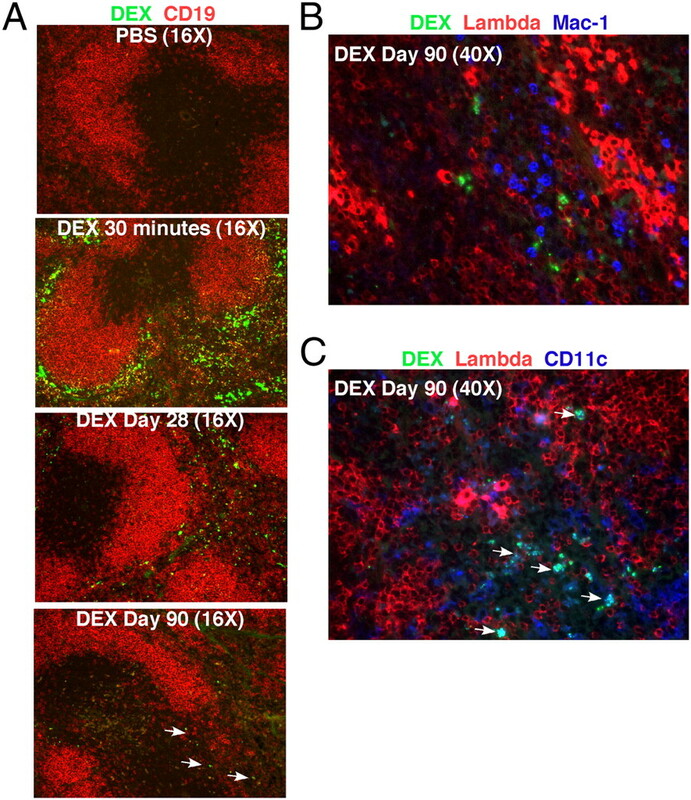 To determine the phenotype of DEX-specific plasma cells, we compared intracellular IgM expression and the cell surface markers expressed on J558 Id+ CD138+ B cells at days 3 and 14 after immunization of TG mice. 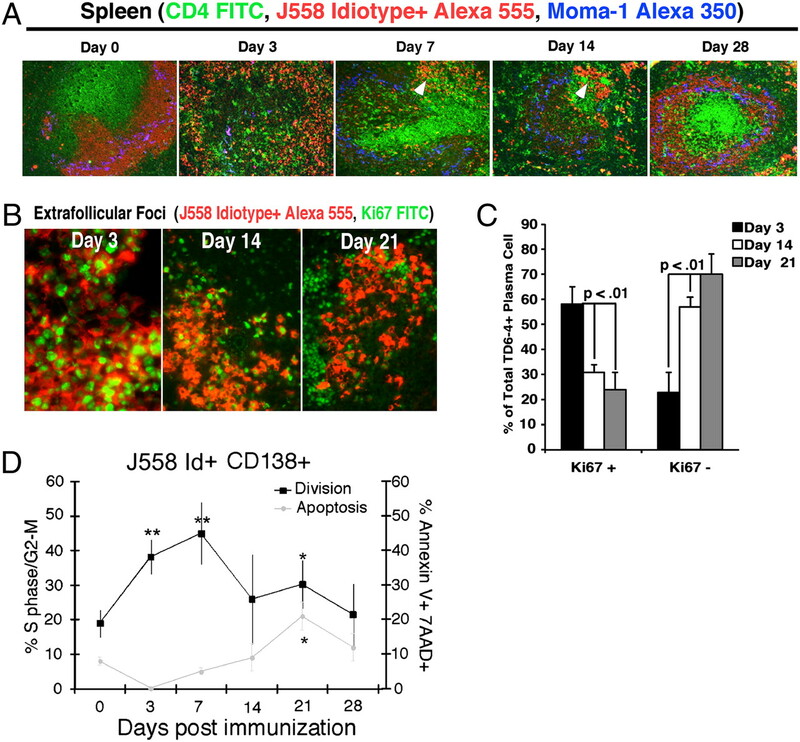 Consistent with a transition from plasmablasts to more mature ASCs, splenic J558 Id+ CD138+ B cells displayed greater intracellular IgM expression at 14 d compared with 3 d postimmunization with E. cloacae strain MK7 (Fig. 2A). However, at each time point, these cells, isolated from the spleen or bone marrow, maintained high levels of MHCII, CD80, CD43, and CD16. 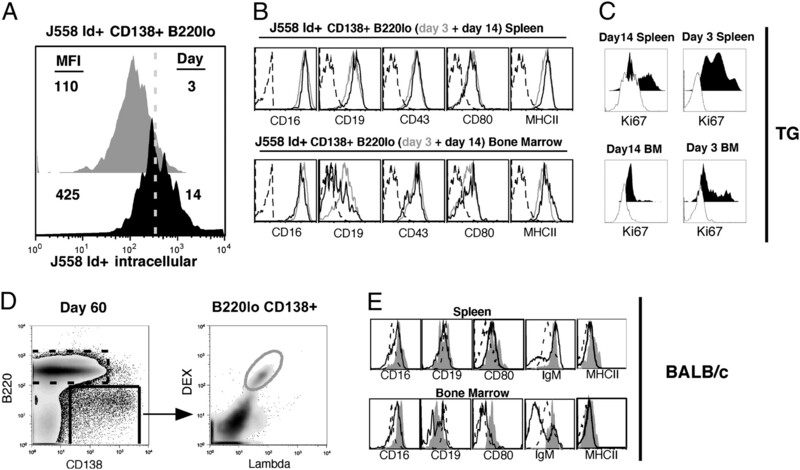 The only exception was that the majority of J558 Id+ CD138+ B cells isolated from the bone marrow 14 d after E. cloacae strain MK7 challenge expressed lower levels of CD19 (Fig. 2B) and Ki67 (Fig. 2C). The equivalent population in the spleen expressed a much higher frequency of Ki67+ cells (Fig. 2C) with the plasmablast surface phenotype maintained in both Ki67+ and Ki67− subpopulations (data not shown). Mature DEX-specific plasma cells in VHJ558.3 TG and BALB/c mice maintain a plasmablast phenotype. A, Comparison of DEX-specific CD138+ B cells isolated from TG mice shows that larger amounts of intracellular DEX-specific IgM are found at 14 d (black histogram) after E. cloacae strain MK7 immunization than at 3 d (gray histogram). B, Cell surface phenotypes of DEX-specific CD138+ cells detected with Abs specific for CD16, CD19, CD43, CD80, and MHCII at 3 d (gray histogram) and 14 d (black histogram) after immunization, compared with an isotype-matched control (dashed black histogram). C, Ki67 expression by DEX-specific CD138+ cells 14 d and 3 d after immunization in the spleen (top panel) and the bone marrow (lower panel). Dashed histogram is that of the negative control sample. 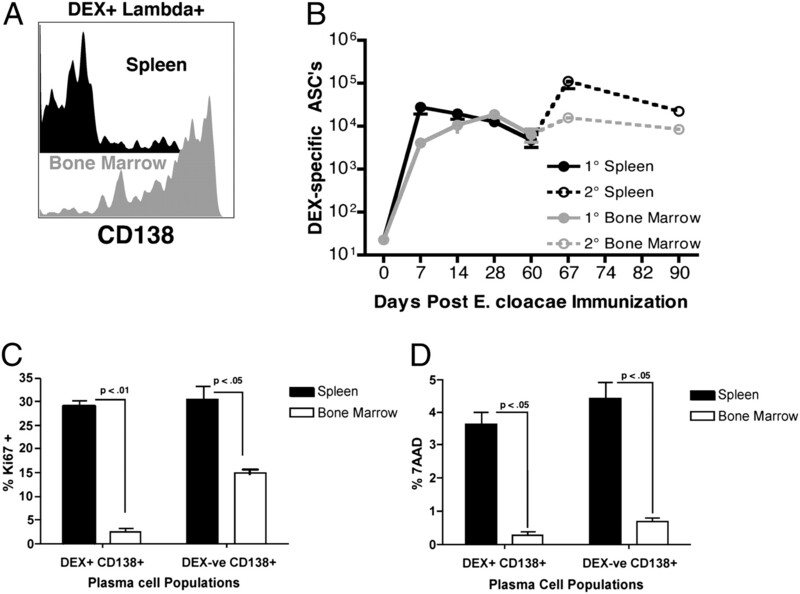 D, Gating strategy to analyze DEX-specific λ+ CD138+ B cells generated in the spleen and bone marrow of BALB/c mice in response to E. cloacae strain MK7 immunization. E, Phenotypes of B220lo CD138+ λ+ DEX-binding B cells (solid gray histogram) at 60 d postimmunization of BALB/c mice compared with bulk B220lo CD138+ B cells (dashed black histogram), and bulk B220+ CD138− B cells (black histogram). Data shown are representative of five VHJ558.3 TG and five BALB/c mice. 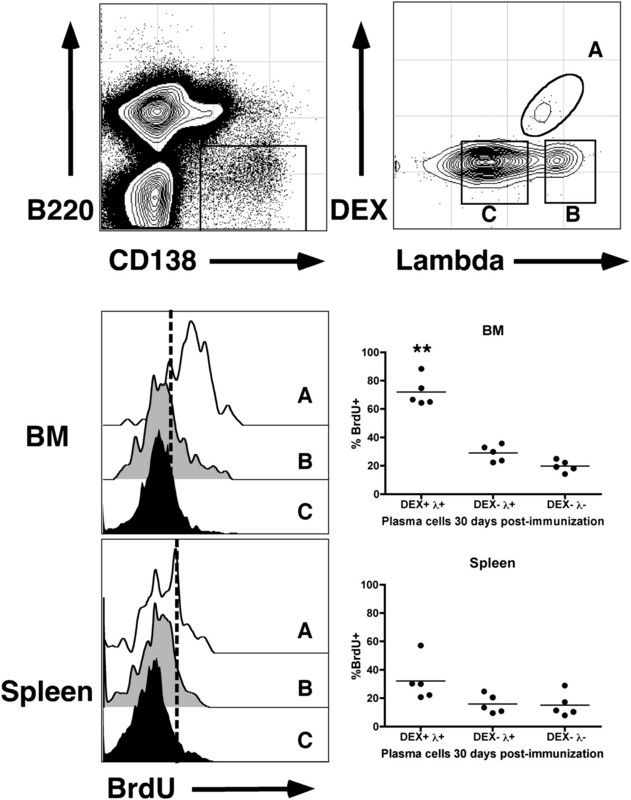 To extend these findings, we examined the cell surface phenotype of DEX-specific CD138+ B cells isolated from the bone marrow and spleens of BALB/c mice 2 mo after a single immunization with E. cloacae strain MK7 (Fig. 2D). Even at this late time point, the majority of DEX-specific CD138+ B cells retained surface expression of IgM (≥80%) and displayed a plasmablast cell surface phenotype similar to J558 Id+ CD138+ B cells isolated from spleen and bone marrow of TG mice (Fig. 2E). The IgM-negative DEX-specific CD138+ B cell expressed either surface IgA or IgG3 (data not shown), correlating with the isotypes detected by ELISPOT and serum analyses. An issue of concern in this flow cytometry-based analysis in BALB/c mice is the possibility of skewing our analysis to immature DEX-specific Ig-secreting cells maintaining surface Ig and missing those that have downregulated surface Ig expression. To ensure that the frequency of plasma cells determined by FACS correlated with the number of ASCs measured by ELISPOTs, we compared the numbers of DEX+ λ+ CD138+ B cells with DEX-specific ASCs. This comparison showed no statistical differences between the two populations, indicating that secretory DEX-specific plasma cells retained surface Ig (Supplemental Fig. 2A). Intracellular staining with anti-J558 Id+ (TD6-4) to identify anti-DEX–secreting plasma cells in the spleen and bone marrow confirmed their retention of surface Ig and CD138 expression (Supplemental Fig. 2B, 2C). These findings suggest that long-lasting production of anti-DEX Abs is maintained by DEX-specific IgM-secreting cells within the bone marrow and spleen that retain expression of surface molecules present on activated B cells and plasmablasts, despite displaying high levels of intracellular Ig. Because of the difficulty of assigning these two mature stages of B cell differentiation to a plasmablast or a plasma cell, we will refer to these cells in this manuscript as ASCs. To reconcile the plasmablast-like phenotype of DEX-specific ASCs with the longevity of the Ab response, we characterized the cellular turnover of DEX-specific plasmablasts in TG mice immunized with E. cloacae strain MK7. As in other marginal zone (MZ) B cell-dominated responses, Ag-responsive J558 Id+ B cells moved from the MZ to the T–B border after i.v. immunization (Fig. 3A), giving rise to peak numbers of Ki67+ plasmablasts at 3 d (Fig. 3B, 3C). From days 7–14, plasmablasts matured to bright IgM-staining cells in the extrafollicular foci and were maintained concurrent with recovery of the MZ B cell compartment at 28 d post-E. cloacae strain MK7 immunization (Fig. 3A). Sixty to 70% of J558 Id+ cells at 14 and 21 d postimmunization were negative for Ki67 expression (Fig. 3B, 3C). This transition from Ki67+ to Ki67− IgM-secreting cells was accompanied by an increased rate of apoptosis (Fig. 3D). These findings demonstrate a concurrent decrease, although not absence of, cell division and an increase in intracellular IgM expression in splenic J558 Id+ plasmablasts beginning 1 wk post-E. cloacae strain MK7 immunization. Extrafollicular J558 Id+ CD138+ early proliferation is balanced by apoptosis later in the response to E. cloacae. A, Spleen sections from VHJ558 TG mice immunized with E. cloacae strain MK7 were harvested at 0, 3, 7, 14, and 28 d after immunization and stained with Abs specific for DEX-specific B cells bearing the J558 idiotype (red), CD4+ T cells (green), and metallophilic macrophages (blue) revealing the presence of J558 idiotype high plasma cells within extrafollicular foci in the red pulp (white arrows). Original magnification ×16. B, Many more extrafollicular J558 Id+ CD138+ B cells express Ki67 at 3 d compared with 21 d after immunization with E. cloacae. Sections of spleen from VHJ558 TG mice immunized with E. cloacae strain MK7 and stained with Ki67-FITC (green) and anti-J558 Id (red). Original magnification ×40. C, Ki67+ J558 Id+ plasmablasts in extrafollicular foci at 3, 14, and 21 d after E. cloacae strain MK7 immunization. Numbers were calculated by counting Ki67-staining cells in five individual extrafollicular foci per three mice. D, DEX-specific plasmablast homeostasis is balanced by proliferation and apoptosis. Analysis of division and apoptosis of J558 Id+ CD138+ B cells using intracellular propidium iodide to determine cell cycle status (black line; left y-axis) and surface annexin V+/7AAD+ staining to determine late apoptotic cells (gray line; right y-axis). Data shown are from three independent experiments (n = 3 mice per experiment). Asterisks show statistical significance in comparison with the day 0 time point. Initial analysis of DEX-specific ASC numbers by FACS and ELISPOT demonstrated an accumulation of DEX-specific ASCs over 28 d within the bone marrow in contrast to the sharp reduction seen in the spleen of BALB/c mice 1 wk postimmunization (Fig. 1). CD138 expression on DEX+ λ+ B cells in the spleen and bone marrow 60 d postimmunization was examined to determine the relative proportions of DEX-specific ASCs present in each tissue. A minor population of DEX+ λ+ B cells in the spleen continued to express CD138 (∼15–30%), which contrasted with bone marrow DEX+ λ+ B cells that maintained expression of high levels of CD138 (>80%), confirming selective accumulation of DEX-specific CD138+ B cells in the bone marrow versus the spleen (Fig. 4A). DEX-specific ASC numbers in the bone marrow remained stable throughout the duration of the primary and secondary Ab response to E. cloacae strain MK7 (Fig. 4B). This contrasted with the expansion and contraction of DEX-specific ASCs in the spleen (Fig. 4B), consistent with previous studies indicating that this is a major site for naive and memory DEX-driven B cell expansion occurring during and after primary and secondary E. cloacae strain MK7 challenge (27). A quiescent population of DEX+ λ+ CD138+ ASCs accumulates in the bone marrow and displays increased intracellular Ig expression. A, The expression of CD138 on surface-positive DEX+ λ+ B cells in the spleen (black histogram) and bone marrow (gray histogram) 60 d after E. cloacae strain MK7 immunization. Data are representative of five mice. B, DEX-specific λ+ ASC numbers were measured in the spleen after primary (black line, closed circles, E. cloacae strain MK7 injected on day 0) and secondary (dashed black line, open circles, E. cloacae strain MK7 rechallenge on day 60) and bone marrow after primary (gray line, closed circles, E. cloacae strain MK7 injected on day 0) and secondary (dashed gray line, open circles, E. cloacae strain MK7 injected on day 60) immunization; n = 5 mice per time point. C, Proportions of Ki67-positive DEX+ λ+ CD138+ and DEX-negative CD138+ B cells in the spleen (▪) and bone marrow (□) 60 d post-E. cloacae strain MK7-immunized BALB/c mice. D, Proportions of 7AAD-positive DEX+ λ+ CD138+ and DEX-negative CD138+ B cells in the spleen (▪) and bone marrow (□) in 60 d post-E. cloacae strain MK7-immunized BALB/c mice. Proportions shown for C and D were calculated from five mice. The accumulation and maintenance of a stable pool of DEX-specific IgM-secreting ASCs in the bone marrow suggested that there were differences in population turnover between the bone marrow and splenic ASC populations. We therefore compared the proliferation and life span of DEX+ λ+ CD138+ B cells 60 d post-E. cloacae strain MK7 immunization of BALB/c mice. Approximately 30% of splenic DEX+ CD138+ B cells were Ki67+, whereas >95% of DEX+ CD138+ B cells in the bone marrow were Ki67−. These results combined with the stability of the DEX-specific ASC population size in the bone marrow indicate that the majority of DEX+ CD138+ B cells in the bone marrow were not proliferating (Fig. 4C, data not shown). Analysis of apoptosis using a comparison of the frequency of late apoptotic cells by 7AAD staining showed that there were ∼10-fold more DEX-specific ASCs in the spleen displaying evidence of late apoptosis than those residing in the bone marrow (Fig. 4D). 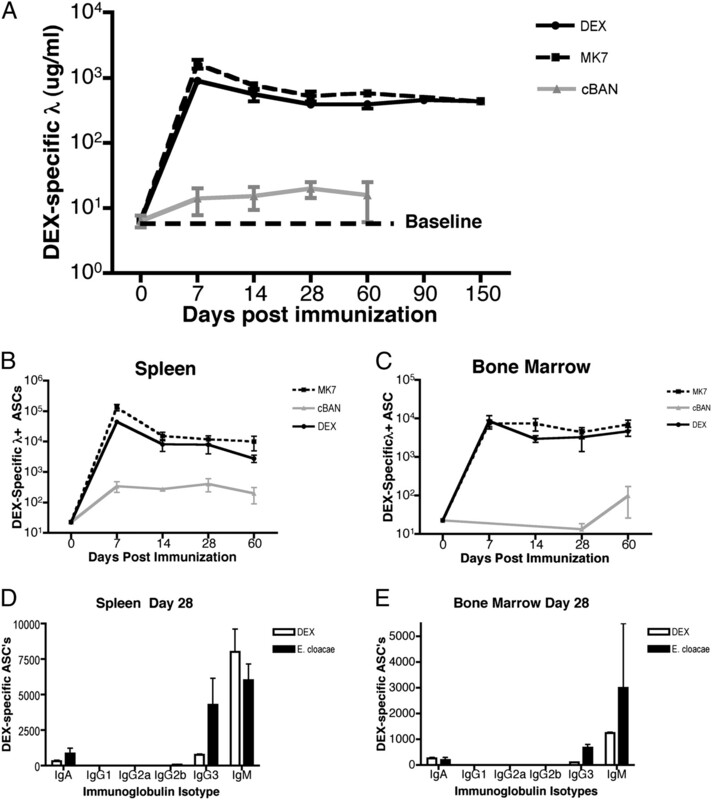 Collectively, our data show that E. cloacae strain MK7 immunization establishes a continuous pool of proliferating DEX-specific plasma cell progenitors in the spleen and a quiescent pool of DEX-specific plasma cells in the bone marrow that develop early and are maintained throughout the Ab response. The prolonged capacity of DEX-specific ASCs in the bone marrow to generate Ab suggested that they are long-lived. To demonstrate the prolonged life span of DEX-specific ASCs, we performed BrdU pulse-chase experiments. E. cloacae-immunized mice were pulsed with BrdU in their drinking water during the peak of the response (for 7 d after immunization) and then switched to normal drinking water for 3 more weeks. Flow cytometry analysis showed that a significantly larger proportion of DEX-specific ASCs in the bone marrow labeled with BrdU compared with those in the spleen (Fig. 5). These results extend our findings that DEX-specific ASCs in the bone marrow are quiescent and have a low turnover rate in comparison with those in the spleen that are continuously responding to persisting Ag. DEX-specific ASCs in the bone marrow are long-lived. Immunized BALB/c mice were fed BrdU in drinking water for 7 d after injection. Four weeks after injection, mice were sacrificed and levels of BrdU incorporation were determined. Top panel shows the electronic gates used to determine DEX-specific ASCs (gate A), DEX-negative λ L chain + ASCs (gate B), and DEX and λ L chain double-negative ASCs (gate C). Middle and lower panels show representative histograms and percentage of BrdU staining positively in each of the three populations (A–C) in the bone marrow and spleen, respectively. Dashed lines in the histograms determine background BrdU staining based on negative controls. Asterisks show statistical significance in comparison with DEX+ λ+ ASCs in the spleen. The phenotype and turnover of spleen DEX-specific ASCs in immunized BALB/c and TG mice suggested that persisting Ag may be responsible for driving the production of dividing plasmablasts. We therefore examined the persistence of DEX in the spleen and bone marrow by FACS and histological analyses. As expected, DEX localized in the MZ associated with MZ B cells and MZ macrophages 30 min after i.v. immunization of BALB/c mice (Fig. 6A). DEX was later found predominantly in the red pulp, where it remained detectable for the duration (7–90 d) of the Ab response (Fig. 6A). At 90 d after injection, DEX was localized in the extrafollicular foci (Fig. 6B) in association with CD11c+ dendritic cells and DEX-specific ASCs (blue-green stain; Fig. 6C, arrows). In contrast, at 28 d postinjection DEX was not detected in the bone marrow compared with the spleen (data not shown). DEX persistence after E. cloacae strain MK7 immunization was not observed using similar detection methods. However, Alexa 647-labeled bacteria were detected in the spleen and bone marrow for up to at least 5 d postimmunization in a pattern similar to purified DEX localization at this time point (data not shown). DEX is associated with MZ macrophages early and later with CD11c+ dendritic cells and J558 Id+ plasma cells at extrafollicular sites after i.v. injection of BALB/c mice. A, DEX (green) is located in the splenic MZ containing CD19+ B cells (red) at 30 min, and later at 28–90 d DEX is found predominantly in the red pulp. White arrows indicate the presence of DEX in BALB/c mice 90 d postinjection. Original magnification ×16. B and C, DEX (green) does not associate with Mac-1+ neutrophils (blue) distinguished by their multilobed nuclei, but associates with CD11c+ dendritic cells (blue/blue green) and λ+ plasma cells (bright red) in BALB/c mice at 90 d after immunization with DEX. White arrows indicate the association of DEX (green) with CD11c+ dendritic cells (blue). Original magnification ×40. Each image shown is representative of three mice per time point. Although it was not possible to demonstrate Ag persistence after E. cloacae compared with DEX immunization, the kinetics and magnitude of the Ab responses were identical, strongly suggesting a role for Ag persistence within the spleen in the prolonged Ab responses observed in each case. Cyclophosphamide, which depletes plasmablasts and short-lived plasma cells, was used to determine the relationship between DEX-specific ASCs in the spleen and bone marrow (28, 32, 33). BALB/c mice were immunized with E. cloacae strain MK7 and then given i.p. injections of cyclophosphamide at 35 mg/kg body weight on days 30–33 post-E. cloacae strain MK7 immunization (28). Four days after the last cyclophosphamide injection (day 38 postimmunization), DEX-specific and total ASCs in the bone marrow and spleen were quantified according to the protocol described in Fig. 7A. Splenic DEX-specific ASCs in cyclophosphamide-treated mice were reduced by 75% compared with PBS-injected mice, whereas the numbers of DEX-specific ASCs present in the bone marrow were not significantly affected (Fig. 7B). Cyclophosphamide treatment also decreased the number of IgM and IgG ASCs in the spleen and IgG ASCs in the bone marrow (Fig. 7C). These results indicate that cyclophosphamide impacted the homeostasis of both Ag-specific and total Ig-secreting ASCs in the spleen, but, with the exception of IgG, not the bone marrow. DEX-specific ASCs in the bone marrow are resistant to cyclophosphamide and maintain serum anti-DEX Ab titers. A, Protocol for the treatment of BALB/c mice immunized with 108 E. cloacae strain MK7 and injected i.p. with either 35 mg/kg cyclophosphamide or PBS on days 31–35 post-E. cloacae strain MK7 immunization. B, Numbers of λ DEX-specific ASCs in the spleen of cyclophosphamide (○)- and PBS (●)-treated mice at 38 d post-E. cloacae strain MK7 immunization. C, Total numbers of IgM, IgG, and IgA ASCs in the spleen and bone marrow in PBS- and cyclophosphamide-treated mice showing significant reductions in IgM and IgG ASCs in the spleen and IgG ASCs in the bone marrow (p < 0.05). D, The numbers of DEX-specific IgM+ Mac1+ B1b B cells in PBS- and cyclophosphamide-injected mice. E, Titers of serum DEX-specific λ+ Abs in mice injected with PBS or cyclophosphamide 38 d post-E. cloacae strain MK7 immunization (4 d postcyclophosphamide injection). Data shown are representative from two independent experiments (n = 5 mice per group). Because B1b B cells respond vigorously upon recall secondary challenge (27), we determined the effects of cyclophosphamide on their homeostasis. Cyclophosphamide treatment reduces the number of DEX-specific, but not total, B1b B cells in the peritoneal cavity by >50%, indicating that both de novo plasma cell generation in the spleen and the DEX-specific memory B cell compartment were affected by cyclophosphamide treatment, whereas DEX-specific ASCs in the bone marrow were unaffected. Despite significant reductions in the aforementioned populations, anti-DEX Ab titers were not significantly different in both PBS- and cyclophosphamide-treated mice, suggesting that Ab produced by the bone marrow DEX-specific ASCs was sufficient to maintain prolonged anti-DEX Ab levels (Fig. 7D). These findings indicate that the bone marrow contains a significant reservoir of cyclophosphamide-resistant ASCs with the potential to contribute to the maintenance of serologic memory to DEX. To confirm the long-lived nature of the DEX-specific ASCs that accumulate in the bone marrow, BALB/c mice were treated with an anti-CD20 mAb to deplete mature B cells, including memory B cells, plasmablasts, and short-lived plasma cells (11, 34, 35). Mice were injected weekly for 3 wk beginning 30 d after E. cloacae strain MK7 immunization and were then sacrificed 1 wk after the last anti-CD20 injection (50 d post-E. cloacae strain MK7 immunization). Anti-CD20 treatments resulted in >100-fold decrease in all splenic B cell populations and a 10-fold decrease in the bone marrow and peritoneal cavity B cells (Supplemental Fig. 3). In agreement with our data from cyclophosphamide-treated mice, the numbers of DEX-specific ASCs (B220lo CD138+), as determined by flow cytometry, were significantly reduced in the spleen, but not in the bone marrow of treated mice (Fig. 8A). DEX-specific B cells in the peritoneal cavity were also reduced upon treatment (Fig. 8A). In contrast, the numbers of DEX-specific ASCs were unchanged in the spleen and the bone marrow upon anti-CD20 treatment (Fig. 8B). Serum levels of DEX-specific Abs were maintained at similar levels following anti-CD20 injections in comparison with the control group, indicating that anti-DEX Abs are maintained after anti-CD20 treatment (Fig. 8C). 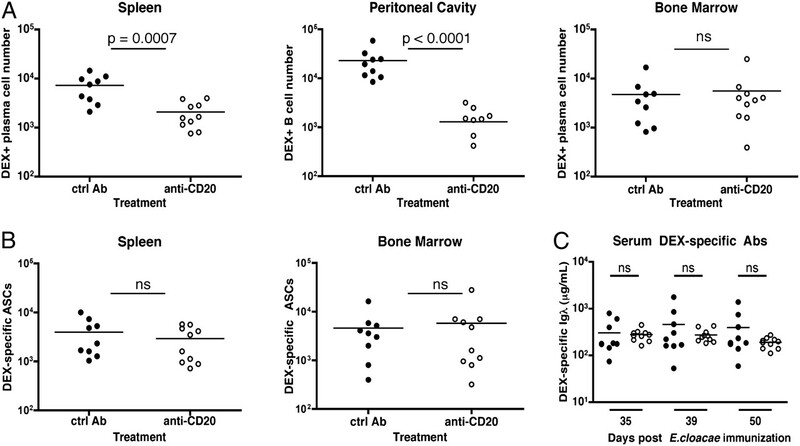 DEX-specific ASCs in the bone marrow are resistant to anti-CD20–mediated depletion and maintain serum anti-DEX Ab titers. A protocol similar to that described in Fig. 7A was used, with the exception that mice received anti-CD20 or IgG2a controls at days 37, 44, and 51 after injection with E. cloacae strain MK7. A, Total cell numbers of DEX+ λ+ CD138+ cells in the spleen and bone marrow, and DEX+ λ+ B cells in the peritoneal cavity as determined by flow cytometry. B, Total numbers of DEX+ λ+ ASCs in the spleen and bone marrow as determined by ELISPOT assay. C, Titers of serum DEX+ λ+ Abs were measured at the indicated time points after immunization with E. cloacae strain MK7. ●, Rat IgG2a control Ab-treated mice; ○, anti-CD20 Ab-treated mice. Data shown were calculated from two independent experiments (n = 5 mice per group). These results highlight the resilience of DEX-specific ASCs in the bone marrow, which are maintained despite B cell depletion by anti-CD20 Ab. In these studies, we have demonstrated that challenge with either DEX or E. cloacae strain MK7 leads to a long-lasting DEX-specific Ab response. This response is driven by the following: 1) the continual formation of short-lived plasmablasts stimulated by persisting Ag in the spleen, and 2) the formation of a quiescent population of ASCs that persists in the bone marrow throughout the Ab response to DEX. In addition to analyzing the kinetics of anti-DEX ASC production, we investigated the effects of persisting polysaccharide on the population turnover of IgM-secreting cells in the bone marrow and spleen. It has been known for many years that polysaccharides introduced by bacterial infections or deliberate injection of synthetic polysaccharides persist in various tissue compartments (17–20). In our experiments, DEX was associated early with MZ macrophages and later with dendritic cells in the splenic red pulp. Thus, residual DEX may continually interact with Ag-specific B cells driving prolonged plasmablast generation. Similar findings were reported in the primary Ab response to phosphorylcholine on Streptococcus pneumoniae and NP-Ficoll (36, 37). 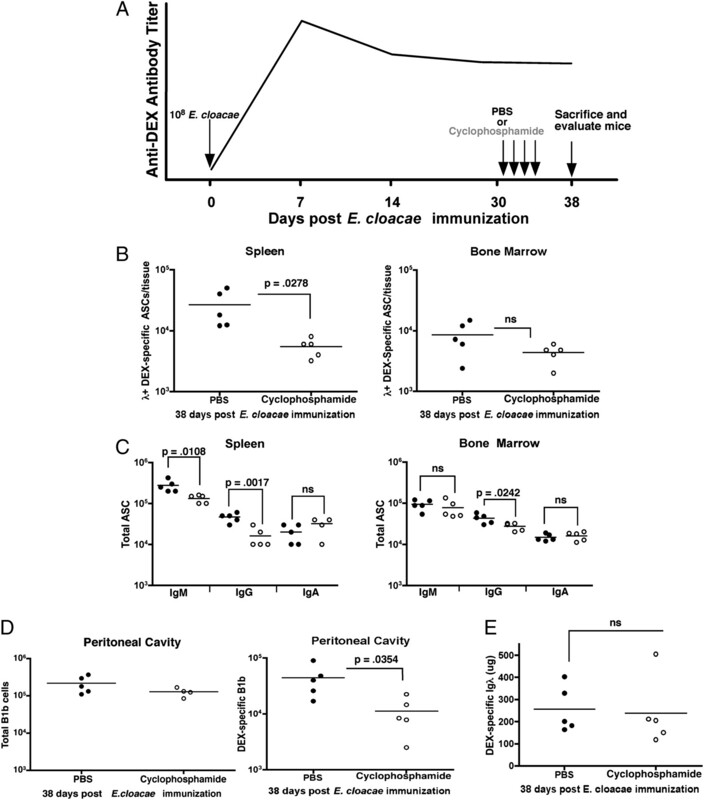 Despite the similar capacity of E. cloacae strain MK7 to induce long-lived DEX-specific Ab production, DEX-associated epitopes on E. cloacae strain MK7 were not detectable in the lymphoid tissues of mice injected with bacteria after 48 h. However, there was clearly continued de novo plasma cell generation in the spleen, as evidenced by Ki67 expression. The inability to visualize DEX after i.v. bacterial immunization may be due to its retention in a form that is not recognized by our detection methods. Similar findings were reported by Schwab and Ohanian (38), attributing a role for neutrophils in breaking down streptococcal wall components into smaller molecules undetectable by conventional fluorescence microscopy. As demonstrated in other models, IgM-secreting cells residing in the bone marrow are the source of prolonged Ab production in response to DEX (23). These cells do not represent a preplasmablast population as they express CD138 as well as high intracellular levels of Ig, unlike preplasmablasts. From a physiological perspective, these cells resemble long-lived plasma cells as they home to the bone marrow, do not cycle, or undergo apoptosis while maintaining serum Ab levels to DEX. The differences between this long-lived ASC population and the classic T-dependent plasma cells have not been described. It is possible that the surface phenotype that they acquire is a result of the nature of the Ag, the nature of the T cell-independent response, and the fact that MZ and B1b B cells are the primary sources of IgM-secreting cells that respond to this particular Ag. DEX-specific IgM-secreting cells within the bone marrow and spleen displayed a plasmablast cell surface phenotype differing only in the lower levels of CD19 expression on ASCs residing in the bone marrow. Downregulation of CD19 is a direct result of Blimp-1–mediated repression of the transcription factor Pax5, which controls CD19 expression and other molecules associated with the B cell lineage and is evidence for mature plasma cell commitment (39). It is possible that downregulation of CD19 limits the signaling capacity of the BCR given the role of CD19 in modulating B cell signaling threshold (40). Although classic long-lived plasma cells and the long-lived ASCs described in this study share some characteristics, it is not clear whether retention of surface IgM and costimulatory molecules is functional in this quiescent state. There are few studies on the nature of long-lived IgM-secreting plasma cells found in the spleen and bone marrow of mice in a T cell-independent response. Recent findings by Racine et al. (23) demonstrate the long-term persistence of IgM ASCs localized in the bone marrow, which maintain serum IgM Abs against outer membrane proteins of E. muris. It has also been shown that B1 B cells homing to the bone marrow provide an important source of serum IgM and IgA influenza-specific Abs (41). In humans, similar to our findings in mouse bone marrow, IgM and MHC class II are expressed on long-lived plasma cell subsets in the spleen and bone marrow. These human bone marrow plasma cell populations also expressed lower levels of CD19 compared with spleen counterparts (42). Therefore, it is likely that IgM-secreting cells in the bone marrow represent a population of ASCs with a unique life span and specificities for bacterial and viral Ags that maintain serologic memory in the form of Ag-specific IgM isotype Abs. It would be of interest to test the resilience of this ASC population in BCMA-deficient animals or after neutralization of BAFF and APRIL, in which long-lived plasma cells fail to develop (43). Our previous work has demonstrated a role for peritoneal B1b cells in the generation of B cell memory to DEX (27). Upon rechallenge, we speculate that, similar to T-dependent long-lived ASCs, T-independent long-lived ASCs we have described have the potential to provide prompt protection against rapidly proliferating and invasive pathogens at the time when memory B1b cells have yet to respond and contribute to the recall response. One way to dissect the individual contribution of Ag-specific B1b and long-lived ASCs in the recall response to T-independent Ags in future work would be to rechallenge mice whose Ag-specific B1b cells have been depleted by cyclophosphamide treatment. To confirm the longevity of DEX-specific ASCs in the bone marrow, we used cyclophosphamide and an anti-CD20 mAb to deplete plasmablasts and short-lived plasma cells (28, 32, 33). In agreement with previous studies, both treatments depleted splenic DEX-specific ASCs, but not those present in bone marrow after E. cloacae strain MK7 immunization. The inability of cyclophosphamide to deplete DEX-specific ASCs present in the bone marrow was likely due to their exit from cell cycle, which may render Ag-specific plasma cells resistant to cyclophosphamide (28). Furthermore, their maintenance, after both treatments, provided evidence that their homeostasis was partially independent of B1b B memory and ongoing Ag-driven plasmablast generation occurring in the spleen given the significant level of depletion of these populations after these cyclophosphamide and anti-CD20 treatments. These findings are supported by recent evidence demonstrating engraftment of long-lived IgM-secreting cells in the bone marrow in response to pneumococcal capsular polysaccharide after treatment with γ-irradiation (22). Likewise, a similar ASC population, responsive to E. muris outer membrane protein, is maintained after doxycycline treatment (23). It was of interest that there were less DEX-specific plasmablasts, as measured by flow cytometry, than ASCs, as measured by ELISPOT assay, in the spleen of anti-CD20–treated mice versus control. It is possible that anti-CD20–mediated B cell depletion reduces competition and promotes the survival of ASCs so that they attain a more mature and surface IgM-negative phenotype, thereby making them undetectable by flow cytometry. It is also possible that anti-CD20 treatment is more efficient in depleting other B cell subtypes that compete for bone marrow-derived stromal factors such as CXCL12, which is required for plasma cell survival. Collectively, these findings demonstrate a role for bacterial polysaccharide in establishing continuous generation of polysaccharide-specific, short-lived plasmablasts in the spleen and a quiescent population in the bone marrow that displays characteristics of long-lived plasma cells. The phenotypic dissimilarities, including maintenance of surface IgM and costimulatory molecules, highlight differences of these populations compared with classical plasma cells derived from T cell-dependent germinal centers. This study and future work will provide pertinent information regarding the design and implementation of vaccines constructed to elicit long-lasting Ab levels to bacterial polysaccharides. We gratefully acknowledge the invaluable technical help of Lisa Jia, Brian Dizon, and Jeffrey Sides. This work was supported by Grants RO1AI014782-29, RO1AI090742, and UO1AI090902 from the National Institute of Allergy and Infectious Diseases.
. 1998. Survival of long-lived plasma cells is independent of antigen. Int. Immunol. 10: 1703–1711.
. 2000. Commitment of B lymphocytes to a plasma cell fate is associated with Blimp-1 expression in vivo. J. Immunol. 165: 5462–5471.
. 2002. Chemotactic responsiveness toward ligands for CXCR3 and CXCR4 is regulated on plasma blasts during the time course of a memory immune response. J. Immunol. 169: 1277–1282.
. 2005. Regulation of CXCR3 and CXCR4 expression during terminal differentiation of memory B cells into plasma cells. Blood 105: 3965–3971.
. 2005. Generation of migratory antigen-specific plasma blasts and mobilization of resident plasma cells in a secondary immune response. Blood 105: 1614–1621.
. 2003. SAP is required for generating long-term humoral immunity. Nature 421: 282–287.
. 2010. Organization of immunological memory by bone marrow stroma. Nat. Rev. Immunol. 10: 193–200.
. 2008. Maintenance of the plasma cell pool is independent of memory B cells. Proc. Natl. Acad. Sci. USA 105: 4802–4807.
. 1958. Persistence of circulating antibodies in human subjects immunized with dextran, levan and blood group substances. J. Immunol. 80: 495–500.
. 1975. Antibody formation in mouse bone marrow. IV. The influence of splenectomy on the bone marrow plaque-forming cell response to sheep red blood cells. Cell. Immunol. 19: 167–182.
. 1999. T-independent type 2 antigens induce B cell proliferation in multiple splenic sites, but exponential growth is confined to extrafollicular foci. Eur. J. Immunol. 29: 1314–1323.
. 1975. Influence of molecular structure of the tolerogenicity of bacterial dextrans. III. Dissociation between tolerance and immunity to the alpha1--6- and alpha1--3-linked epitopes of dextran B1355. Immunology 29: 611–619.
. 2006. Competence and competition: the challenge of becoming a long-lived plasma cell. Nat. Rev. Immunol. 6: 741–750. 1949. The significance of antigen in animal tissues. J. Immunol. 61: 107–117.
. 2001. In vivo clearance of glucuronoxylomannan, the major capsular polysaccharide of Cryptococcus neoformans: a critical role for tissue macrophages. J. Infect. Dis. 184: 479–487. 1981. Tolerogenic or immunogenic activity of hapten-conjugated polysaccharides correlated with cellular localization. Eur. J. Immunol. 11: 212–220.
. 1981. Induction and persistence of B-cell tolerance to the thymus-dependent component of the alpha(1 leads to 6) glucosyl determinant of dextran: recovery induced by treatment with dextranase in vivo. Immunology 44: 517–527.
. 2006. B cell clones that sustain long-term plasmablast growth in T-independent extrafolli-cular antibody responses. Proc. Natl. Acad. Sci. USA 103: 5905–5910.
. 1985. Induction of germ-line anti-alpha 1-3 dextran antibody responses in mice by members of the Enterobacteriaceae family. J. Immunol. 135: 3468–3472.
. 2007. Histoplasma capsulatum alpha-(1,3)-glucan blocks innate immune recognition by the beta-glucan receptor. Proc. Natl. Acad. Sci. USA 104: 1366–1370.
. 1955. Heterogeneity in dextran preparations. Arch. Biochem. Biophys. 59: 61–75.
. 2009. Generation of B cell memory to the bacterial polysaccharide alpha-1,3 dextran. J. Immunol. 183: 6359–6368.
. 2009. Induction of long-lived allergen-specific plasma cells by mucosal allergen challenge. J. Allergy Clin. Immunol. 124: 819–826.e4.
. 2001. Marginal zone and B1 B cells unite in the early response against T-independent blood-borne particulate antigens. Immunity 14: 617–629.
. 1983. Analysis of idiotypic heterogeneity in the anti-alpha 1-3 dextran and anti-phosphorylcholine responses using monoclonal anti-idiotype antibodies. Ann. N. Y. Acad. Sci. 418: 151–170.
. 1999. IgMhighCD21high lymphocytes enriched in the splenic marginal zone generate effector cells more rapidly than the bulk of follicular B cells. J. Immunol. 162: 7198–7207.
. 2004. Short-lived plasmablasts and long-lived plasma cells contribute to chronic humoral autoimmunity in NZB/W mice. J. Exp. Med. 199: 1577–1584.
. 2009. Functional memory B cells and long-lived plasma cells are generated after a single Plasmodium chabaudi infection in mice. PLoS Pathog. 5: e1000690.
. 2008. Maintenance of long-lived plasma cells and serological memory despite mature and memory B cell depletion during CD20 immunotherapy in mice. J. Immunol. 180: 361–371.
. 2010. Rituximab specifically depletes short-lived autoreactive plasma cells in a mouse model of inflammatory arthritis. Proc. Natl. Acad. Sci. USA 107: 4658–4663.
. 1999. Dendritic cells associated with plasmablast survival. Eur. J. Immunol. 29: 3712–3721.
. 1967. Degradation of streptococcal cell wall antigens in vivo. J. Bacteriol. 94: 1346–1352. 2006. Transcription factors that regulate memory in humoral responses. Immunol. Rev. 211: 269–279.
. 1997. Qualitative regulation of B cell antigen receptor signaling by CD19: selective requirement for PI3-kinase activation, inositol-1,4,5-trisphosphate production and Ca2+ mobilization. J. Exp. Med. 186: 1897–1910.
. 2008. Dual role for B-1a cells in immunity to influenza virus infection. J. Exp. Med. 205: 3053–3064.
. 2004. Antigen-selected, immunoglobulin-secreting cells persist in human spleen and bone marrow. Blood 103: 3805–3812.
. 2010. The immortality of humoral immunity. Immunol. Rev. 236: 139–150.